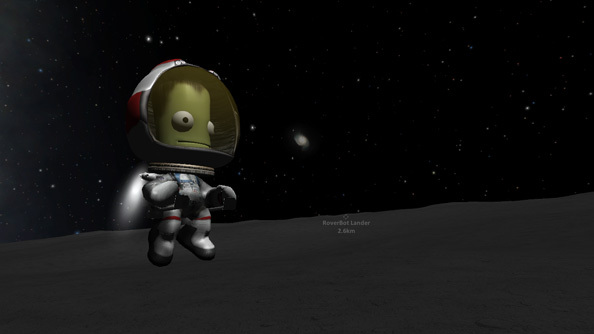 Kerbal Space Program is a game about space travel. Authentic space travel, the kind you get by sitting on top of a controlled explosion until you’re going so fast that gravity can’t catch you, the kind that uses maths and trigonometry to trace out great arcing orbital transfers between celestial bodies, the kind that goes catastrophically wrong from time to time and scatters charred debris all over the side of a mountain. Kerbal Space Program looks like a cartoon but plays like a simulator, one in which you construct and fly rockets of your own design in order to explore and colonise a sandbox of distant planets and moons. It’s fun, it’s undendingly challenging and it rewards the ambitious, Lego-brained space farer, but it’s not finished. The first build was first released over two years ago and has been continually developed ever since, but is it worth buying into the early access version on Steam now? Or should you sit and wait and watch from the sidelines until the developers give the all clear with a full release? The current version, described by the developer as ‘sandbox complete’ includes a whole heap of space stuff. Seven planets, each a rough approximation of a real planet within our own solar system, orbit the fictional star of Kerbol. Most of these planets have moons and are, relatively speaking, all positioned and sized as you would roughly expect to find them in reality. That means the crafts you build are infinitesimally teensy in the grand scheme of this cosmic billiards table, requiring weeks and months to sail across the vast inky voids that separate your home planet of Kerbin and the celestial destinations hanging in the great beyond. Time acceleration takes care of the chrono-tedium of space travel, but the hard task of raw navigation is down to you and the few tools the map screen offers: rockets must be fired with the utmost precision and with expert timing to adjust your ship’s plotted trajectory, taking its course close enough to another planet so as to be captured by its gravity well, and then firing with full thrust to prevent yourself from either catapulting right past the thing or colliding with its alien surface at tens of thousands of miles per hour. Simply arriving in orbit around another planet is an achievement in itself, one that comes after days of practice and determination. From there you can decide to try to touch down on its surface, to step foot on its soil and plant a flag to mark the occasion, or (if you’ve got the fuel to spare) to fly back home like a whimpering space coward. 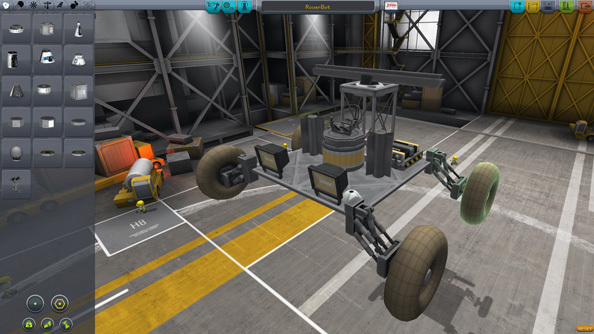 Recently added parts include driveable wheels for constructing rovers, probe bodies for launching unmanned ships and docking ports that allow you to construct monumental space stations by launching parts of the habitat individually and connecting them together in orbit. It’s the sheer number of possible configurations that these parts allow for, and the ability to create wildly different ships, planes, rockets and rovers that compounds Kerbal Space Program’s innate longevity. The number and variety of planets and the types of craft you can build presents a scaling challenge too, one that starts with simply building a multi-stage vehicle capable of reaching a stable orbit and ends with the absolute limit of your ability as a pilot. What’s missing, currently, is any sort of career mode or structured set of missions, which makes the existing version of Kerbal Space Program strictly a sandbox experience. Willing astronauts are unlimited, as are the resources available to your program, so you can freely build and experiment with your designs, sending repeated failed creations cartwheeling through the sky in a fiery column of hydrogen death. Player-created missions exist if you go poking around Reddit. These set out some arbitrary objectives and stipulate artificial restrictions: can you get to the moon and back using a ship built with only seven parts? Can you build a spaceplane capable of entering low orbit? Kerbal Space Program requires that you contribute your own imagination to its sandbox, that you set your own stakes, raise your own bars and push your own envelopes to get the most out of it. Updates for Kerbal Space Program are slowly and very steadily released, but the current version is as stable and polished as any finished product and, though missing a host of features, is a complete enough sandbox experience to warrant a purchase now rather than waiting. There are some concerns: the most recent update broke compatibility with old save game files for example, and while developer Squad addressed most problems with a conversion tool, some players were forced to abandon projects and old missions. A thriving modding scene mitigates the slow pace of development of the main game however, enabling new features such as auto-piloting, satellite mapping and drilling for fuel on alien worlds. Kerbal Space Program’’s current version asks that you accept some of its temporary shortcomings, the lack of a career mode, a tech tree or any degree of resource management. In return it offers something much more compelling, a complex, detailed and complete space simulation sandbox, the open-ended challenge of which delivers its own huge rewards. Buy it now, and enjoy the unfolding of what is undoubtedly one of the greatest space sims ever not-yet-made. 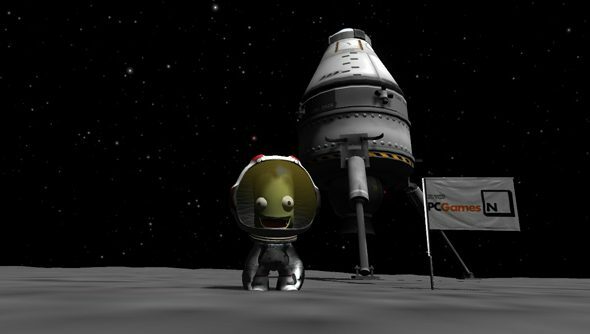 You can find Kerbal Space Program on Steam as well as on the Kerbal Space Program website. It costs $23. This review was edited to reflect that Squad do not consider the early access version of their game to be ‘alpha’ in the development sense — it is a “point of pride” that each release is alpha and beta tested to ensure playability and polish at every stage of development.